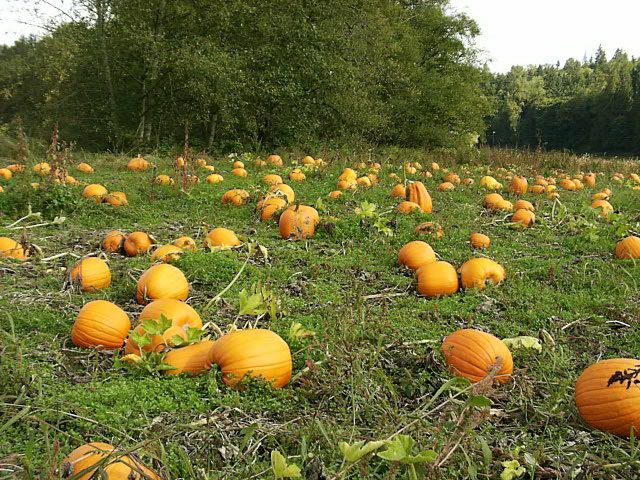 Whether you are growing pumpkins for carving Jack-o-lanterns or for baking pies and cookies, your level of success will be greatly determined by the amount of preparation that goes into the planting area and selecting a variety suited to your growing area. Pumpkins may be white or orange skinned, and range in size from miniatures like the 4"-5" 'Baby Bear' up massive one ton specimens! However, growing giant pumpkins is far more time consuming and involved than caring for typical Jack-o-lantern sizes. The miniatures and bush types of pumpkin can be grown in large planters. Pumpkin plants are warm weather crops that thrive in hot climates. They require a fairly long growing season and take up a lot of space in the garden. Pumpkin plants grow best in full, hot sun, but they are somewhat tolerant of light shade. They are susceptible to damage from even a light frost. but overhead watering should be avoided to prevent powdery mildew. 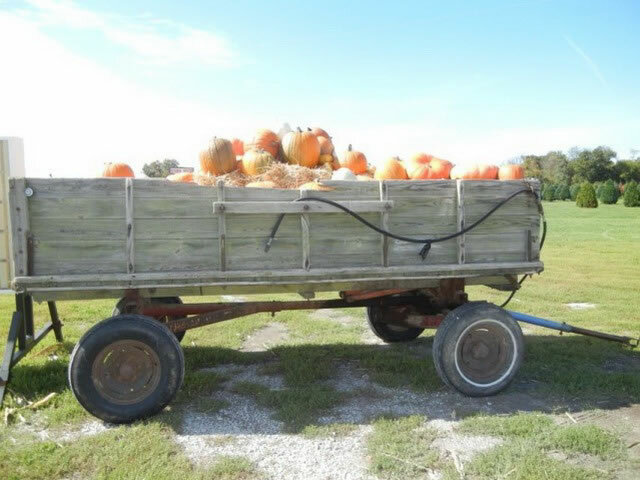 Pumpkins consume a massive quantity of nutrients from the soil so it is a good idea to mix in a shovel full of well composted manure into the soil below the spot where you will plant your seeds. Adding a generous amount of compost to the soil will help maintain moisture in well drained soil. The soil pH should be between 5.0-7.0. Pumpkins can be grown in rows spaced 8-10 feet apart, but for better results they should be planted in mounds to ensure good drainage. The mounds have the added benefit of the soil warming sooner. The mounds should be 4"-5" tall, about 24" in diameter and spaced 6 to 10 ft. apart. 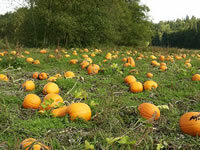 Do not plant pumpkin seeds until all danger of frost has passed and the soil has begun to warm in the spring. Pumpkin seeds can be soaked overnight to speed up germination. Plant 4-5 seeds, ½" deep on each mound and cover them with fine soil and firmed down. When the seedlings are 3" tall, thin them back to the 1 or 2 strongest seedlings on each mound. If you live in an area where spring is slow to arrive, you can start your pumpkin seeds indoors about 3 weeks before the time to plant them in the garden. Keep soil moderately moist and maintain a temperature of 70°-75° until germination, which takes 7-10 days. Water regularly and thoroughly but avoid overhead watering. Feed every three weeks with a general use garden fertilizer. Control weeds and watch for bugs and slugs. Place a piece of wood or some straw under each ripening fruit to hold them up off the soil. 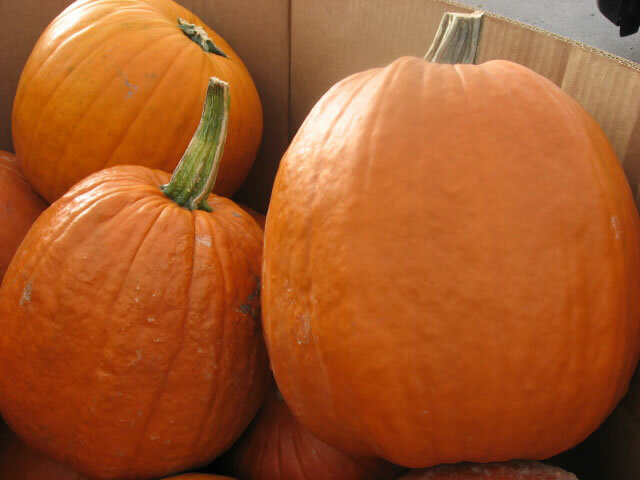 Contact with wet soil can cause your pumpkin to rot. 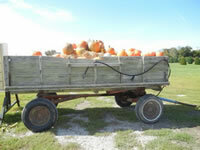 Pumpkins are ready to harvest in late fall. Cut the stems after the first frost, but allow the pumpkins to remain in a sunny spot for a week or two so the skin can cure and harden. To grow giant pumpkins, remove all the blossoms as soon as the first fruits begin to develop and only allow the best one (or two) pumpkin to continue growing on each vine. If you get lots of pumpkin blossoms but no fruit, the problem may be due to a lack of bees in your garden. This can easily be remedied by hand pollination. Peel back the petals of a male flower and stick the pollen covered stamen on the pistil of the female flower in a twisting motion to rub the pollen onto the pistil. Female flowers are smaller and have a pod that develops behind the flower petals. The male flowers are larger but you will only see the stem behind it.